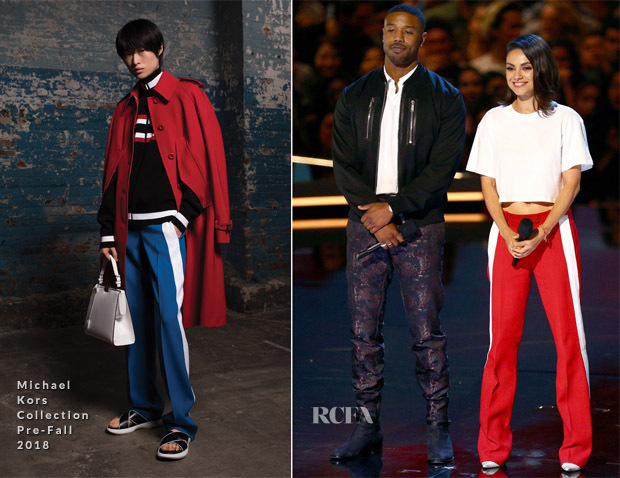 Mila Kunis joined Michael B. Jordan on stage while presenting at the 2018 MTV Movie And TV Awards on Sunday (June 17) in LA. As we all know Mila favours black, but on this occasion she shocked me by selecting this colourful, sporty look from Michael Kors’ Pre-Fall 2018 collection. The look is simple, easy and relaxed with sit perfectly within her wheelhouse. And I’m sure you won’t mind the pumps being paired with this look on this occasion as her sporty trousers are tailored rather than track pants. Hailey Baldwin was ripped for pairing track pants with heels.